Today we're looking back at one of our favorite 'no flower' weddings we did for a lovely couple, Carrie and Adam. The couple was looking to have succulents and earth tones to decorate their early fall wedding. As featured on Style Me Pretty, our Creative Director, Denise Fasanello, shared more background details for the floral design of the wedding - "October rain could not dampen the mood for this amazing couple. Carrie and Adam came to me requesting no flowers for their wedding! Imagine, me a flower designer hearing those words. But I was eager to translate their design desires for all greens, succulents and interesting seed pods and the like. 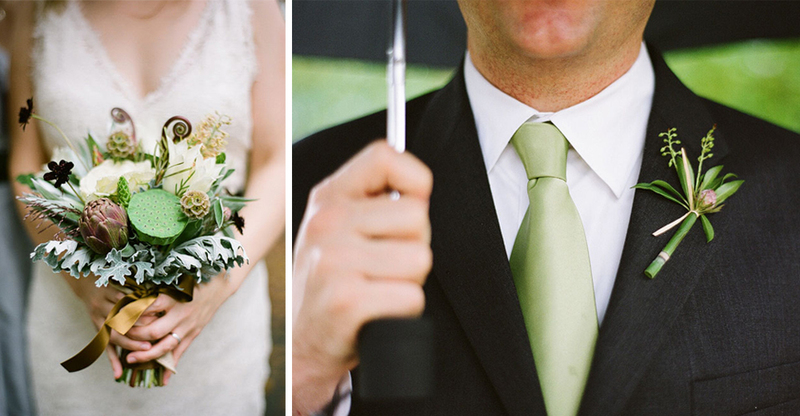 It was a dreamy green affair."